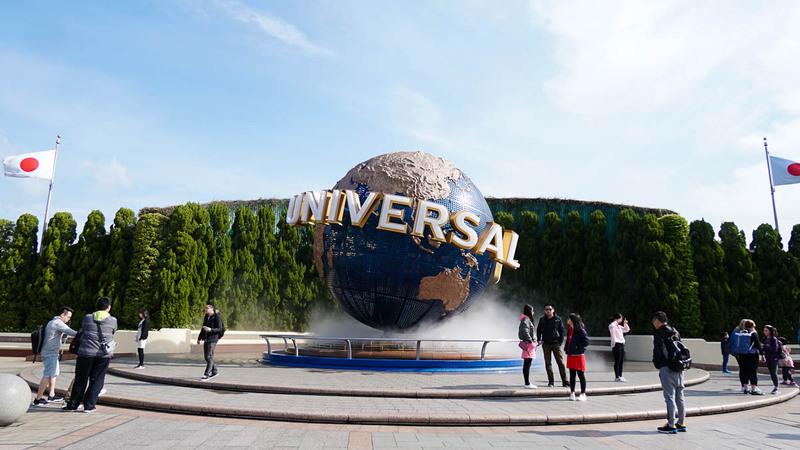 For those heading to Universal Studios Japan, this is the only USJ guide you will EVER need. 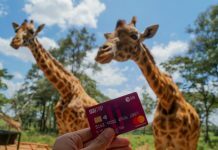 From tips to maximise your time, insider hacks to getting the most out of your experience, to even getting cheaper USJ tickets. Update: Universal Cool Japan 2018 is back! If you grew up with the popular Japanese RGP games like Final Fantasy and Monster Hunter or watched the manga series Sailor Moon and Detective Conan, you’ll love these 4 new additions! Find out more about Universal Cool Japan 2018 here. 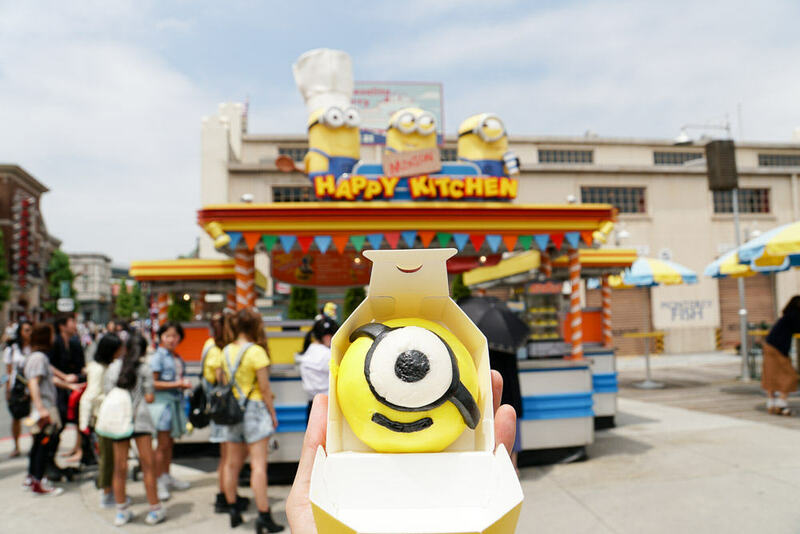 If you’re travelling to Osaka, spending at least a day at Universal Studios Japan is definitely a must! Whether you’re a rollercoaster loving individual, couple, family with kids, or Harry Potter fan, there’s something for everyone. 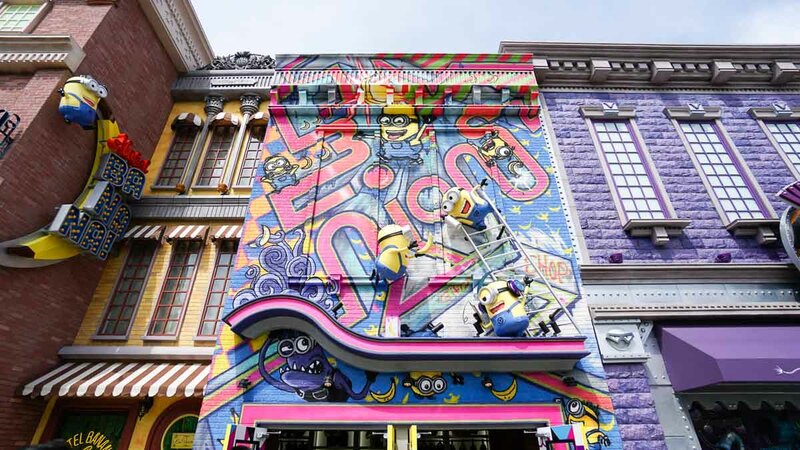 Fans of Despicable Me can even get an overdose of cuteness at the newly opened Minion Park in USJ! It’s our second time to Osaka and USJ, and I dare say that this won’t be the last. 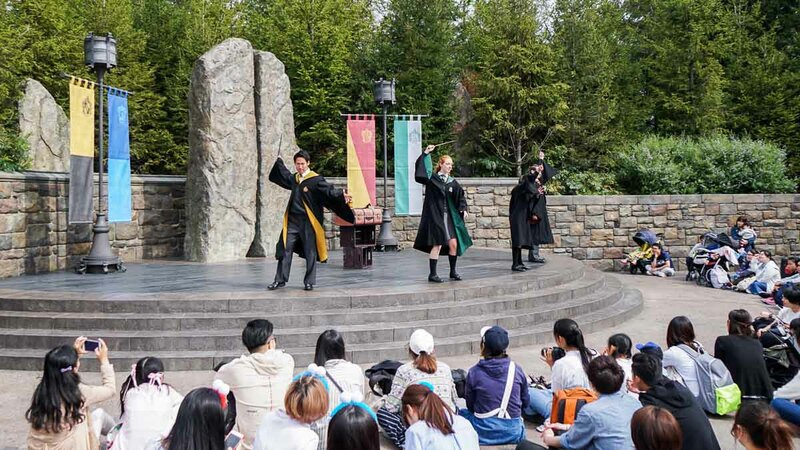 The park constantly reinvents itself, with new additions like the Minion Park and Harry Potter Expecto Patronum Night Show since we visited last year. 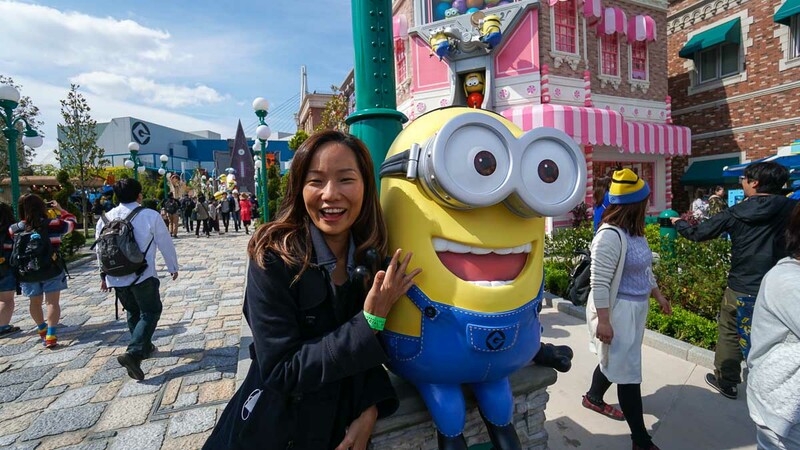 This time though, we decided to put together a comprehensive USJ guide to planning a perfect day at the theme park. The problem with USJ is that it’s EXTREMELY popular with both local Japanese and foreign tourists. Plan your day wrongly and you might end up stuck in the queues for hours instead of enjoying the rides. It also doesn’t help that the official Universal Studios Japan site offers limited information. Some stuff can only be found in Japanese! To help you out, I’ve split this guide into three main sections: Pre-USJ Planning, USJ Day Guide, and Frequently Asked Questions. Pay close attention to Section One! Note: Will try updating this frequently so it should stay relevant! Tickets can be bought on the day itself at the front counter. But unless you are a BIG FAN of queuing, please save yourself some time and buy your USJ tickets beforehand. Don’t be one of the clueless tourists stuck in the queue long after the park has opened. If you’re fluent in Japanese or have a Japanese friend, you can try navigating the USJ booking website. However, we found it much easier to get our USJ tickets via Klook, an authorised reseller of USJ. The process was fuss free, and we were issued an e-ticket instantly. We simply had to scan the QR code at the automated entrance gantry. Talk about skipping the queues! The best part though, is that the retail price is literally the same! Please don’t be silly and pay extra at the park’s ticketing booth. *Pro-tip: For those who want a little more time, there’s a new 1.5day USJ Pass. Start at 3pm on the first day, and enjoy the park for the entire second day. If your travel schedule allows, try to plan your visit to USJ in the middle of the week. 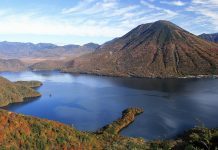 The weekends are usually notoriously crowded, with an influx of Japanese tourists. 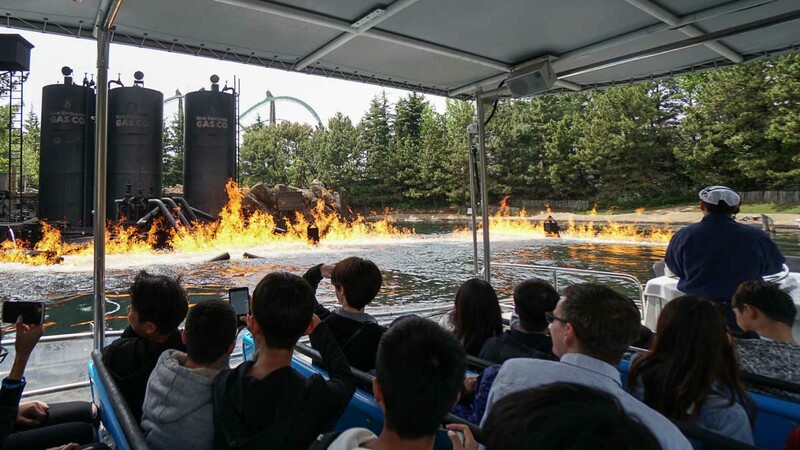 According to park officials, the days near the weekends can also be quite packed as locals may take leave for a long weekend, and schools may send students on excursions to USJ. Of course please avoid holidays! Here’s a list of Japanese public holidays. 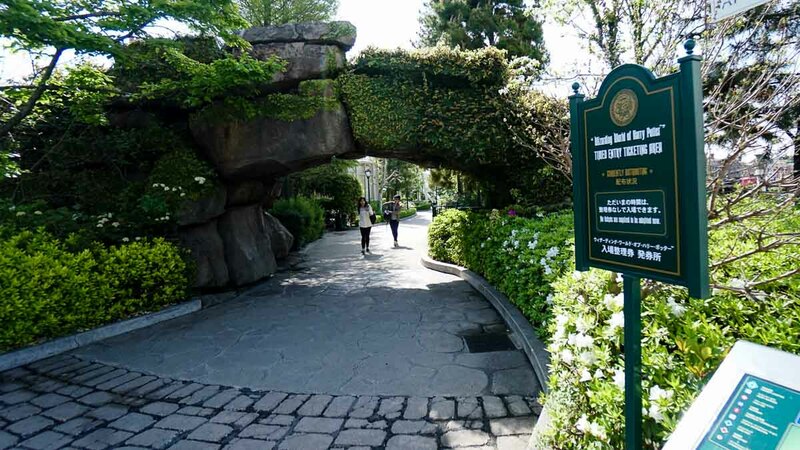 If you read this guide carefully and follow the tips from start to the end, there is a very good chance that you will not need the USJ Express Pass or USJ VIP Pass. However, if you’re travelling in a big group or is unable to avoid the peak days of the week, I definitely suggest getting them to have more time enjoying the park. This basically gives you the highly coveted timed-entry ticket to the Wizarding World of Harry Potter (so you don’t have to run across the park to collect your timed-ticket on busy days), and allows you to skip the queues for certain rides depending on the type of USJ Express Pass you get. Some rides have fixed time periods, which is great as you are assured of breezing through the queues. Here are the 6 different types of USJ Express Passes. A frustrating thing is that the price of the USJ Express Pass ranges from ¥5000-¥17,300 depending on demand and supply. It’s usually on the lower side, but please check! You can buy your USJ Express Passes here. Unfortunately magic won’t help you cut the queues. Only the USJ Express Pass can. The USJ VIP Wristband Pass is a cheaper and pretty interesting alternative to the Express Pass. Instead of gaining priority access to selected rides, you get to enter USJ 30mins to 1hr earlier than the normal crowd! Which means you get to at least hop on 2 rides before the main crowd streams in. The USJ VIP Wristband Pass comes with Harukas 300 Observatory ticket, which means you get to see Osaka from high above on top of getting into USJ early. You’d get a secret password for use on a special link in order to obtain the meeting time for the special entry. Quite cool eh? *Pro-tip: Try to arrive earlier than the designated time so you can be at the front of the Special Entry queue. Get the USJ VIP Wristband + Haruka 300 Pass here. 4) Decide on your route – Adventure, Harry Potter, or Cute? 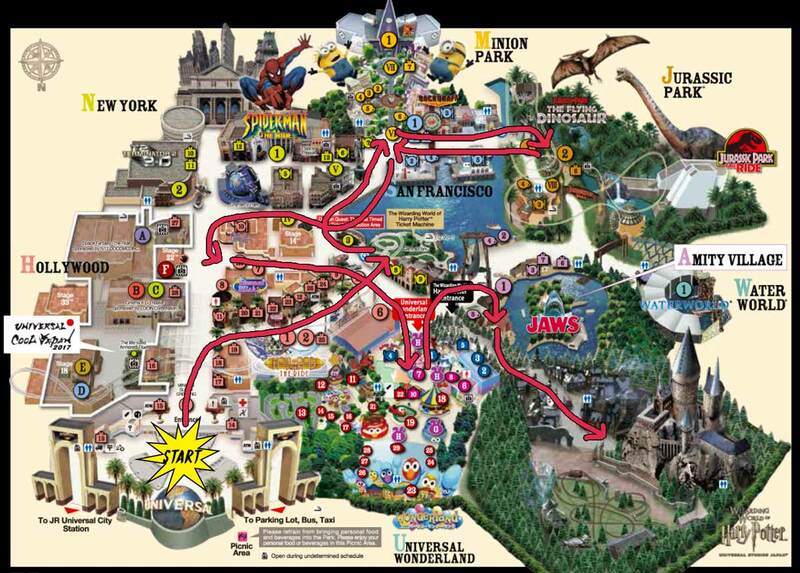 Here are 3 possible USJ itineraries or ride routes you can follow for those who did not get the USJ Express Passes. I’ve split them by interests so even if the park is packed, at least you get to experience the things you are most interested in! I’ve excluded the less interesting attractions that tend to be lost in translation. Alternatively you can plan your own route using the USJ Park Map. Check out the Shows & Attractions Timetable too. For the routes below, prioritise the first 3 rides before slowing down to explore the decor. If you’re fast, you should be able to finish the first 2 rides with minimal queuing, and the 3rd with a fairly short queue time. For the thrill seekers who love rollercoasters. Fans of Harry Potter, look no further. 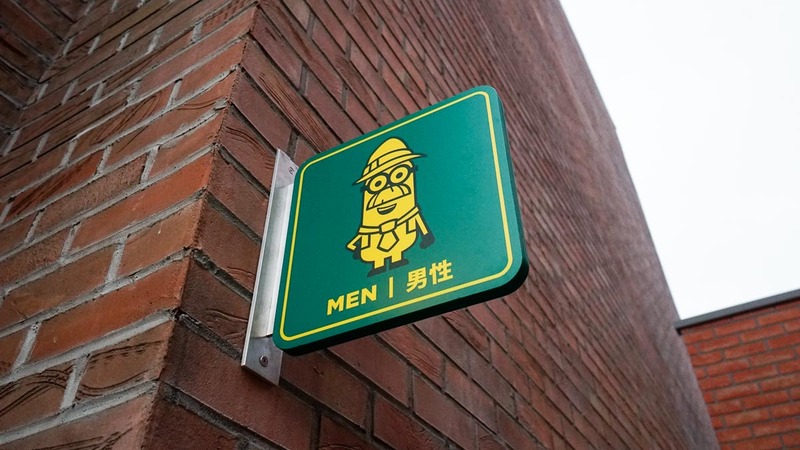 For those who love the Minions, Hello Kitty, Snoopy or Sesame street. Generally hang around The Wizarding World of Harry Potter from late afternoon to night so you get to catch the new night show. *Pro-tip: The various photo points clear up near showtimes and towards the evening. So don’t waste time queuing for them in the first half of the day if the line is long. If you want to get to USJ early and easily, it is best to stay near the park. There are a couple of official hotels just outside the park, but these are pretty expensive. For us, we stayed at J-Hoppers Osaka Universal Hostel, which is only 1 JR stop (Ajikawaguchi Station) or a 15mins walk away. 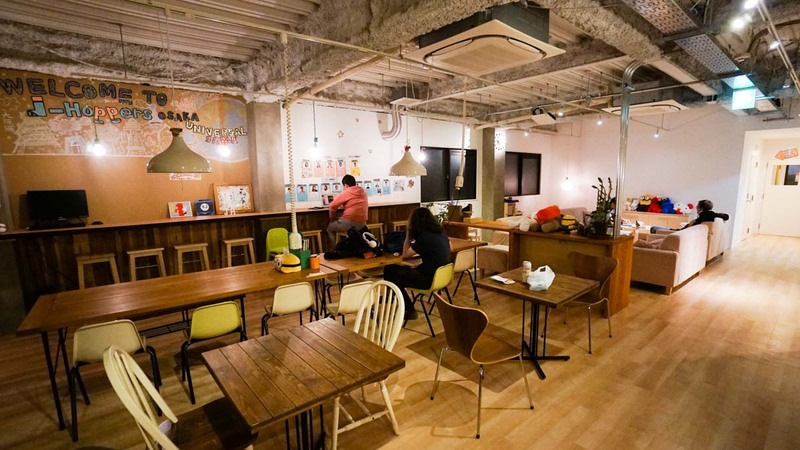 It’s a really beautiful hostel, cheap, and super convenient for getting to and away from USJ. Especially loved the friendly staff and movie screenings every night! Try not to crash anything on your way to USJ. 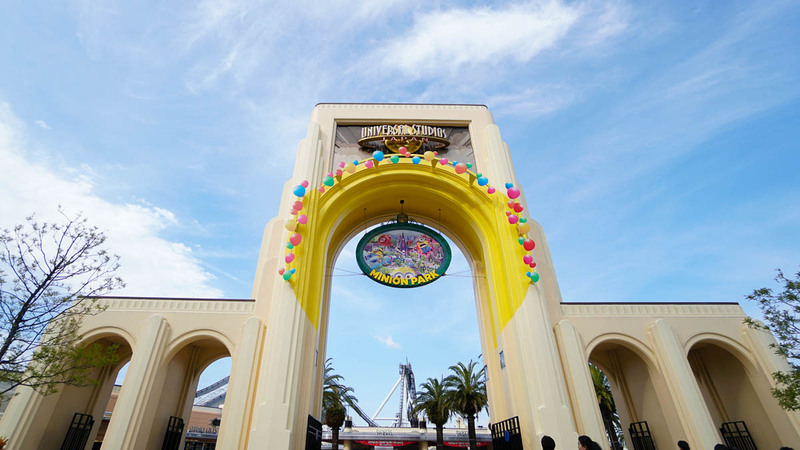 Universal Studios Japan opening hours vary, so check the official site for calendar timings. 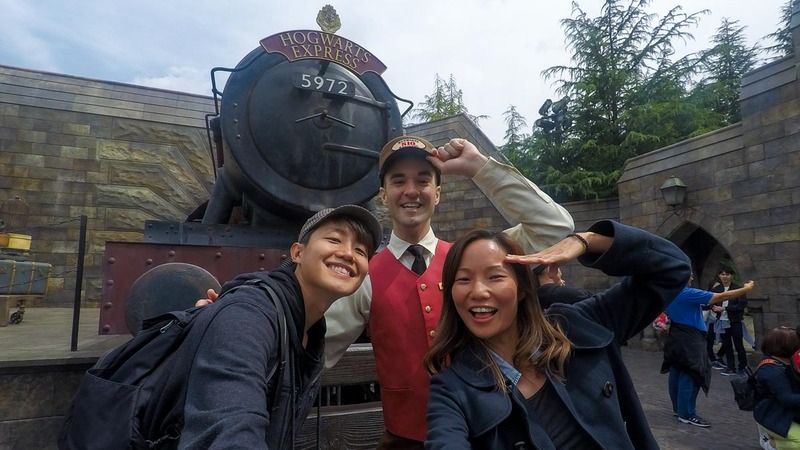 Too bad the Hogwarts Express can’t take you straight into USJ. 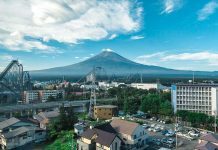 Take the JR Yumesaki Line (also known as JR Sakurajima Line) to Universal City Station. USJ is just a 5mins walk from the station. Unless you are coming straight from the airport, I don’t recommend taking a bus. Busses from Kansai International Airport take 35-75mins (¥1550) depending on traffic. If you bought the Osaka Amazing Pass (which is a great way to explore Osaka), you can take the “Captain Line” for free (normal price ¥700) from Kaiyukan West Pier (near Osaka Aquarium) to Universal City Port in 10minutes. The downside is that the ferry service only starts running at 9:30am. It is a good alternative for getting away from USJ if you leave before 8pm though! 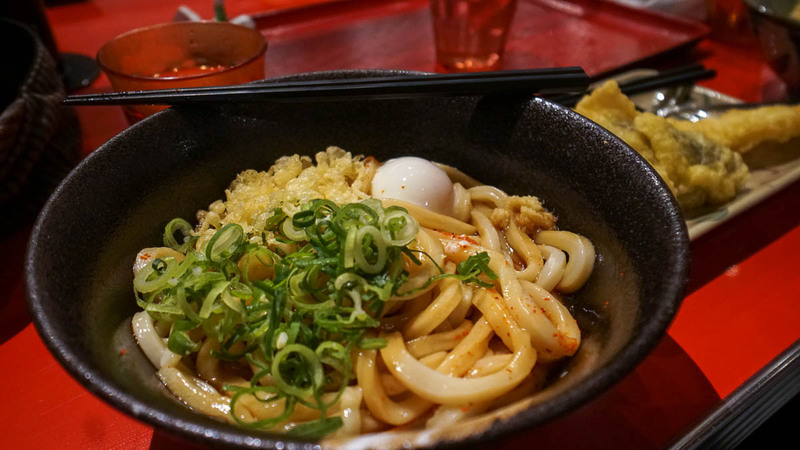 While food inside USJ isn’t insanely expensive, it isn’t exactly budget. If you would like to stretch your dollar for the cute desserts instead of the main meals. 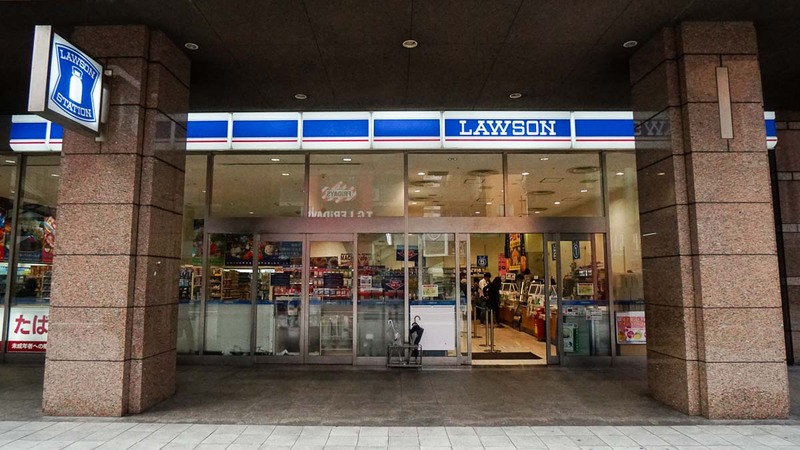 There’s a Lawson convenience store just outside Universal City Station, and is a great place to get some breakfast. Technically you aren’t allowed to bring outside food into the park, but it’s easy to sneak an onigiri or two in your jacket. On the two occasions we were there, our bags got checked once, but they didn’t check out pockets. Do also bring a water bottle as there are water coolers around the park. It can get pretty expensive buying drinks constantly for hydration! 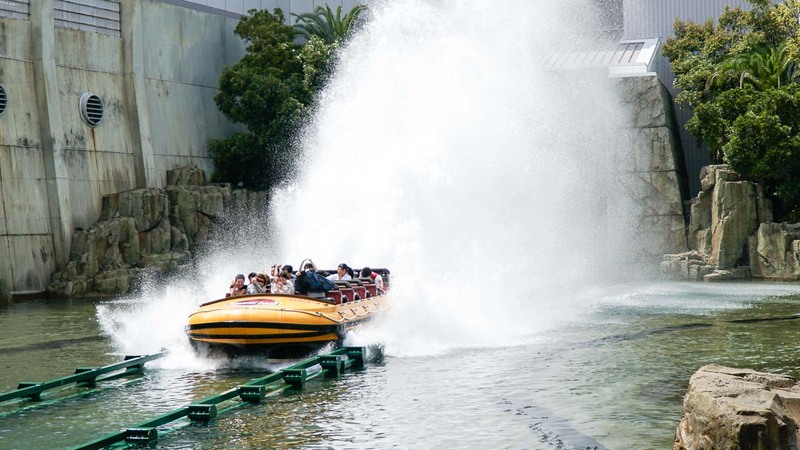 If you are game and don’t mind getting wet taking the Jurassic Park – The Ride, bring along your own disposable poncho. It’s much cheaper than getting it inside USJ. 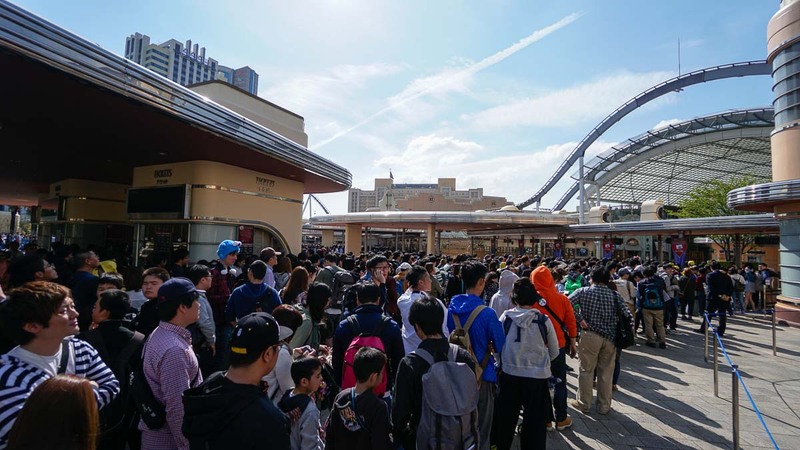 If you do not have a USJ Express Pass, and the crowd looks like it’s crazy, head straight for ticketing site inside USJ at Central Park to obtain your timed ticket to The Wizarding World of Harry Potter. During peak days, there can be a ridiculous queue just to enter The Wizarding World of Harry Potter (not even talking about the rides). By getting a timed ticket, you are assured of an entry time into the themed zone. 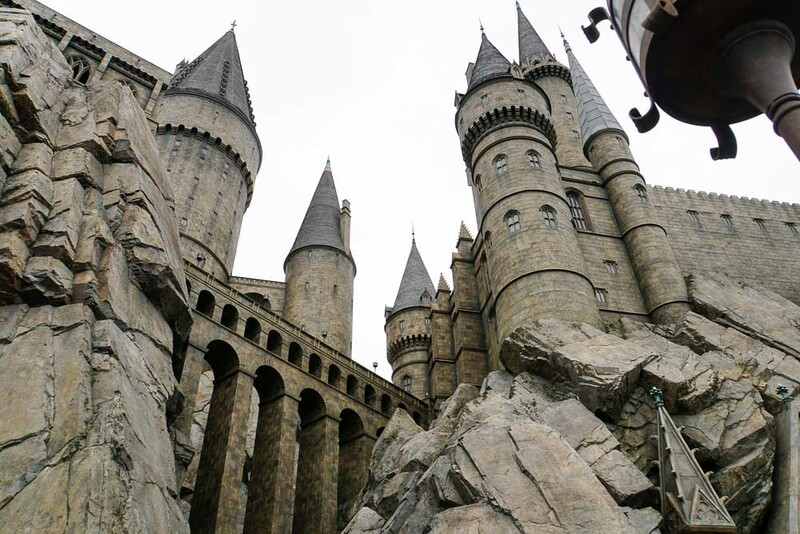 Even if you are not a Harry Potter fan, it is a must-do to visit. Note that the timed ticket is only valid once, and is not applicable for re-entry. Thankfully, once you are inside, you can hang around for as long as you want. 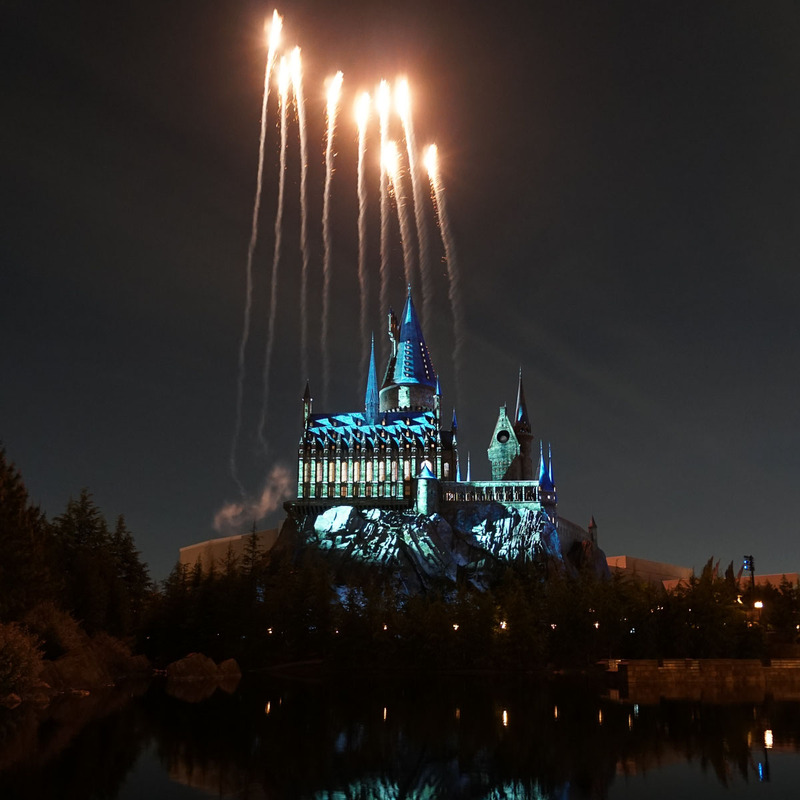 If you can, aim for a late afternoon slot as there is a new Expecto Patronum Night Show at Hogwarts Castle. *Pro-tip: The view at the restaurant 3 Broomsticks is the best, so try and get a butterbeer there to enjoy the show. Head inside 30mins before the show as the staff will block the side entrance when the show is about to start. 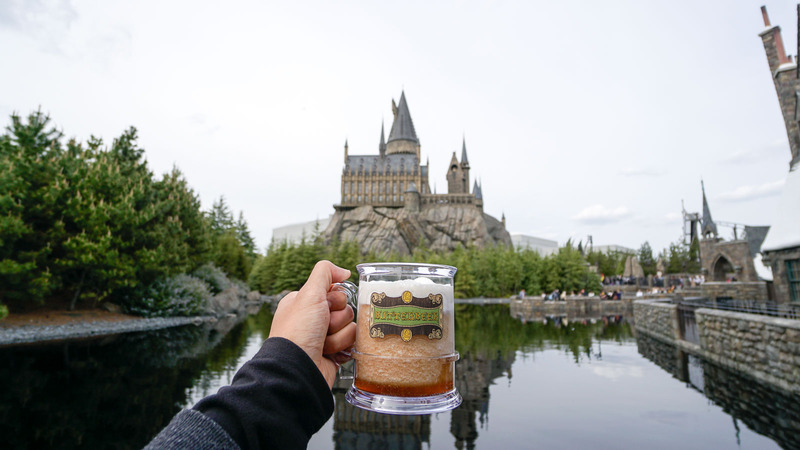 Get the frozen butter beer. It’s like ice cream! 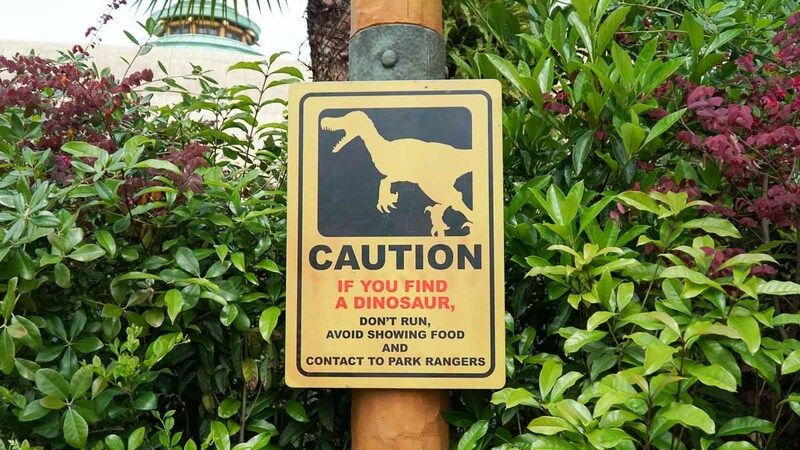 If you followed Point 4, you should have a game plan in mind before entering the park. While it’s good to stick to the plan, keep an eye out on the electronic signboards that show the queue times around the park. You never know as a popular attraction might become available for whatever reason! Unless you really need to take the ride with your friends or family, always queue at Single Rider Lanes if the waiting time is long. The Japanese prefer sticking together, so the Single Rider Lanes tend to be emptier and move a lot faster. Who knows, you might just make a new friend with a stranger screaming your lungs out together. Souvenirs and merchandise from USJ can be pretty pricey. If you want something small as a keepsake, do ask the friendly staff for stickers! They’ll be more than happy to oblige. Sumimasen. Sutekkā ga arimasu ka? *Pro-tip: The Minion stickers can only be obtained in the Minion Park! Alternatively you can go window shopping in the merchandise shops. For the best seats in the house, try to shuffle your way to the middle of the waiting room when watching Theatre Shows. The staff will usher guests from left to right. By standing in the middle, you will end up close to the centre of the stage for a better experience! If you’re interested in catching any of the parades, plan to arrive at least 30mins before the start of the show to get a good view. We had to catch the Minion Parade and Harry Potter Expecto Patronum Night Show twice because our spots were so bad. For the Harry Potter Night Show, avoid the first show timing as it’s insanely packed unless you can get into the 3 Broomsticks restaurant earlier. 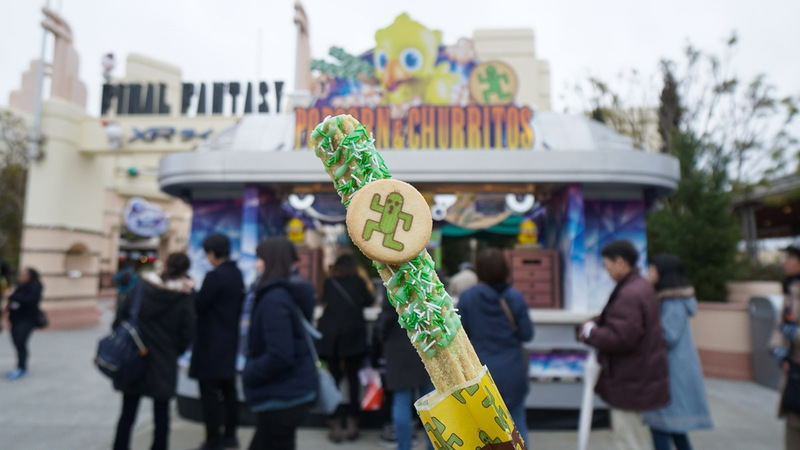 A visit to Universal Studios Japan isn’t only about the rides. It’s about the atmosphere and vibe too! A lot of attention has actually been put into the decor so remember to explore your surroundings. 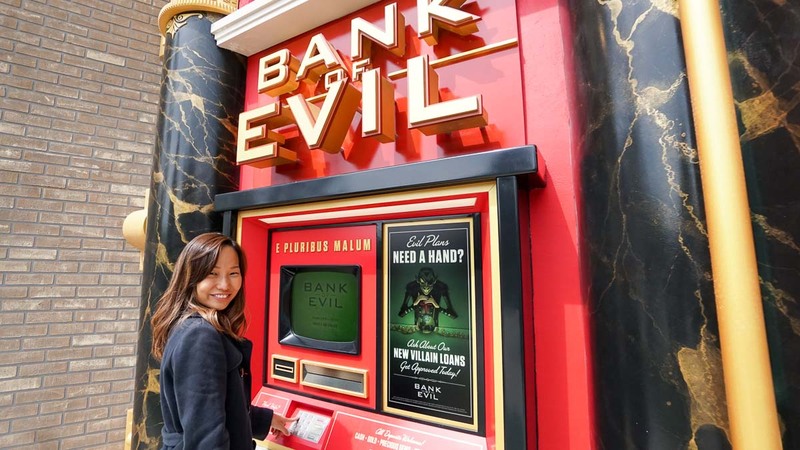 We especially loved the “Bank of Evil” in the Minion Park where you can withdraw money from “someone else’s” bank account. You can also hear Moaning Myrtle crying in the ladies toilet inside the Wizarding World of Harry Potter! If you don’t want to eat in USJ, there are plenty of restaurants for all budgets just outside at Universal City Walk. The park closes between 7-9pm depending on the day, so you can easily end the day with a meal after maximising your time in the park. 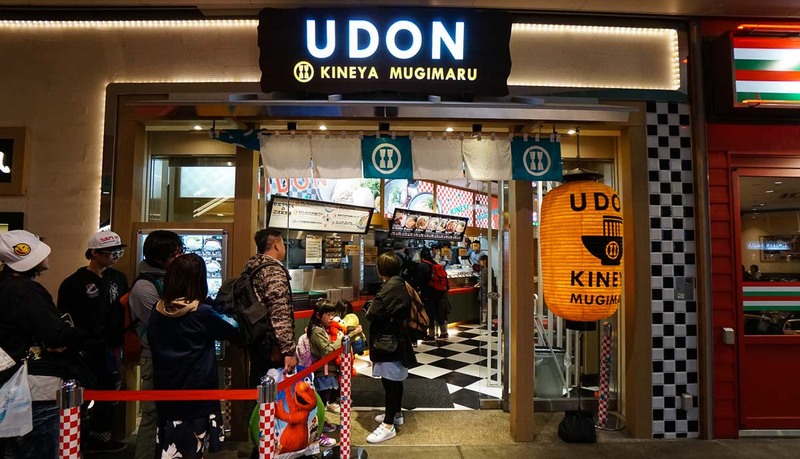 We had dinner at Udon Kineya Mugimaru on the 1st floor, which serves hearty and cheap udon. Are the rides and shows in English? Unfortunately, almost all the rides and attractions are in Japanese. It’s a little odd hearing Harry Potter in Japanese though. 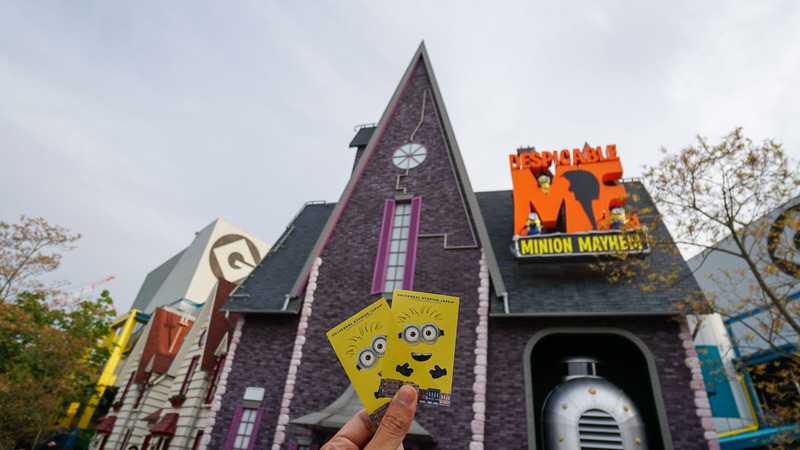 However, the Despicable Me Minion Mayhem ride has english subtitles! Banana? Minion talk is probably easier to understand than the shows. Should I buy a 1 day or 2 day USJ Studio Pass? Personally I will get the 1 day USJ Studio Pass because I would like to spend more time exploring other parts of the Kansai region. 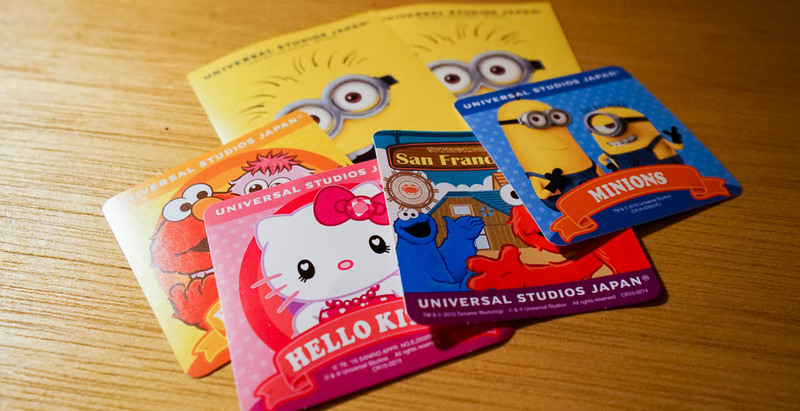 But if you like to take things slow, it’s also fine to get a 2 day USJ Studio Pass. Can I re-enter the park after heading outside for lunch? You will not be allowed to re-enter the park. I’m sure if you have a genuine “emergency”, the staff will be able to make special arrangements though. 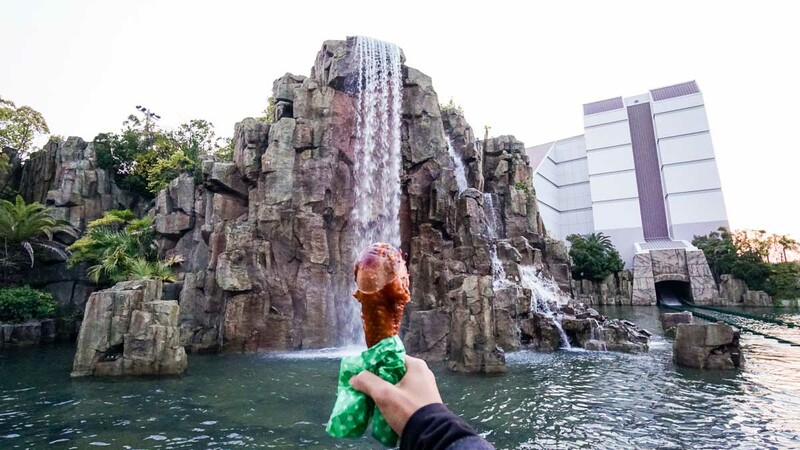 *Pro-tip: We suggest grabbing breakfast from Lawson before entering the park, munch on snacks for lunch, and have dinner at Universal City Walk. What if I need to change my USJ Ticket dates? You’re in luck if you booked your USJ tickets via Klook! The e-tickets are typically valid for an extended period of time (as stated on your confirmations lip). 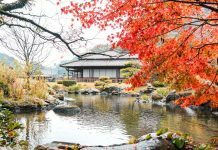 So you do not have to worry if you need to make changes to your Osaka travel plans. However, USJ Express Passes are only valid for the day you bought them due to their dynamic pricing. What are your favourite attractions in USJ? Without a doubt, The Wizarding World of Harry Potter, Minion Park, and Hollywood Dream Backdrop the ride! We love Harry Potter so much we even bought wands at Ollivanders to cast spells at the various magical wand zones. 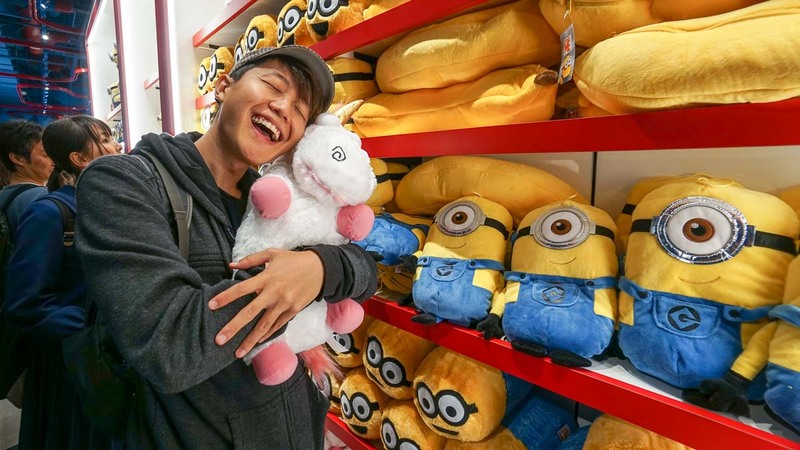 Minion Park on the other hand was just a bunch of cuteness. 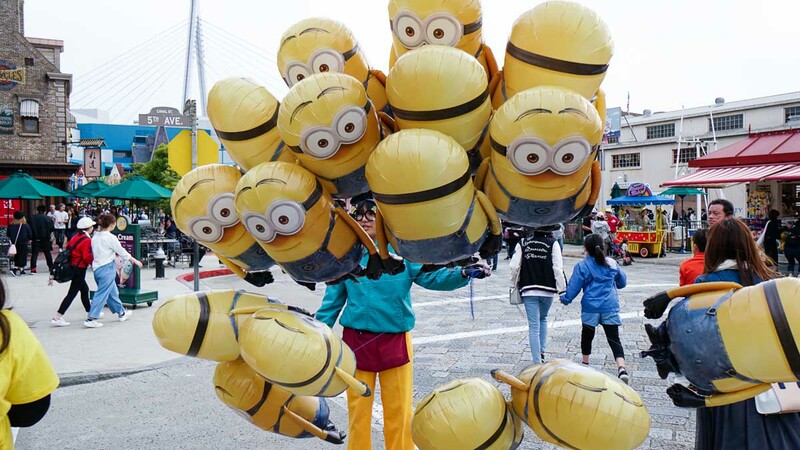 Be sure to hang around for the Minion Parade and photo taking ops. Hollywood Dream Backdrop is simply the best ride in the park (pick song 1 or 2). What snacks should I try in USJ? 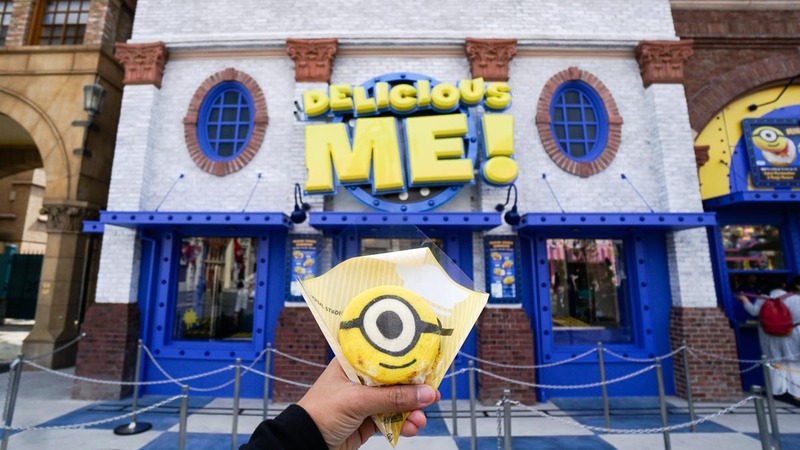 Minion cookies at Minion Park (though it’s too cute to eat), turkey leg at Jurassic Park, and a frozen Butterbeer at The Wizarding World of Harry Potter. Butterbeer! Sadly it’s non alcoholic. 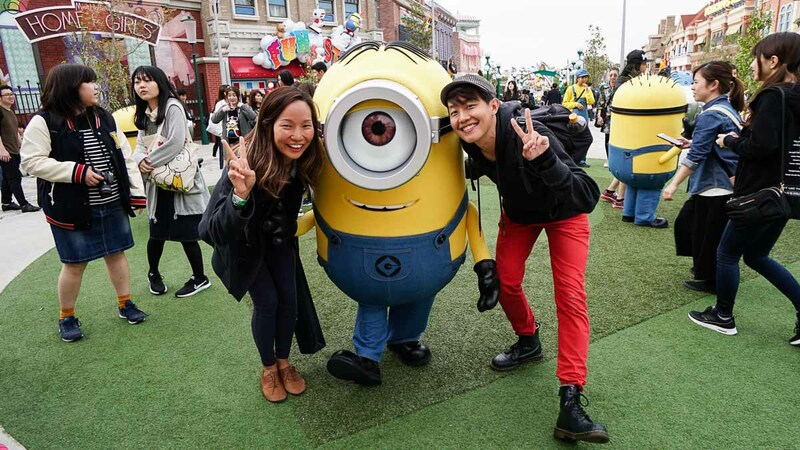 Hope you found our ultimate USJ guide and tips to planning a magical experience useful. Do share with us your tips and experience in the comments section below! 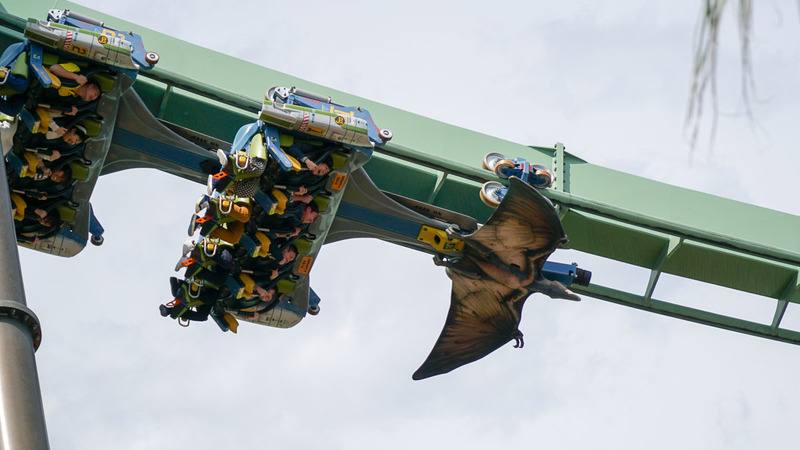 Maybe it’s time to book your tickets to Universal Studios Japan now. Read also: New rides in USJ to look out for in 2018! This post is brought to you by Klook. Very informative piece on USJ! Love the tips given! Is the SUMMER70 code still valid? Thanks in advance. Yes it is! But hurry! Hi! When I purchase the USJ Express Pass ticket on Klook, will it give me my time slot for the Harry Potter ride? Yes it does! However we got ours in Japanese. You can either ask a staff for help or ask a friend who knows Japanese. I used a mixture of copy pasting on Google Translate and a friend to confirm our timed entries. If you drop me a mail on our contact form I can send you a picture of what it looks like. There’s a QR code for scanning but the info is mainly in Jap. Gave feedback for them to improve though! Thanks. Useful tips & guide, particularly #4. Hi! Since the USJ Express pass gives you a time slot for the Harry Potter ride, I assume it gives you head of queue privileges to get into the Wizarding World of HP. However, what are my options if my ride time slot is for the morning and I also want to go back in the late afternoon? Can I get in line for a timed entry ticket with the rest of the public? Thanks for your help! Yes you can just queue for a timed ticket as well if necessary. But if you try to go on weds or thurs as suggested there shouldn’t be a problem! 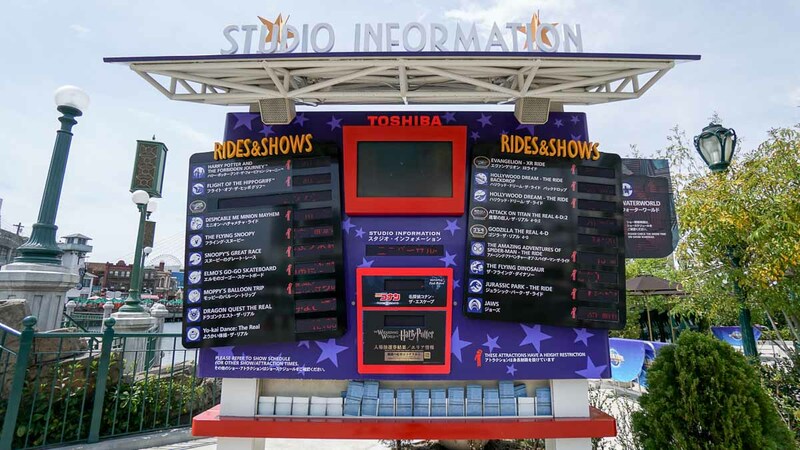 What is your opinion – usj 1.5 day pass vs usj 1 day+express4? Hello! It depends on which day you are going. You never really know! I personally think 1day + express is better because you get to spend the other day doing something else. Hello there! If after i take the time ticket for HP late afternoon slot as suggested, how can i go to the HP Forbidden Journey since you suggested for me to go there after i take the time ticket in the late afternoon? Hi Nami! The idea is to take the timed ticket as backup but try your luck at the HP Forbidden Journey because you never know, there might be no queue! It will be my first time to USJ this Dec. May I check with you (hope it’s not a dumb question) if the timed ticket is required to take the HP Forbidden Journey? If there is no queue, we can take the ride even without the ticket? Also if I get the express pass, the timing indicated is purely decided by Klook? Thanks for your time. Yup if there is no queue you don’t need the timed ticket. Unfortunately USJ will be the ones who determining the timing for the express pass. Hi, can I know what do I need to produce to get the HP time ticket? Thanks. Hello! I believe just your entry ticket! 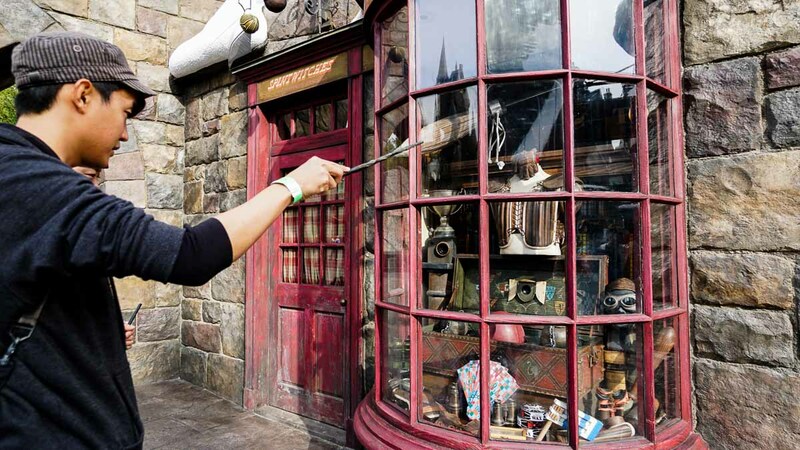 Hi, like to find out more about the timed ticket to The Wizarding World of Harry Potter… How does it works? Is it similar to Disneyland whereby there a machine for you to press on for the ticket and time is fixed. E.g. first 5 people who press for it will receive timed ticket for 10:15 to 10:45am and the following 5 people will receive timed ticket for 10:30 to 11am? Hello! When the park is experiencing heavy traffic, the timed tickets will be required. Most of the time it won’t be required especially if you follow the tips! However, in the event that you want to get one, the machine will give you options to choose based on what’s available! Hopefully not much has changed since then. Hi Guy, This is such a useful information that I’ve ever seen before. However, I have a doubt on few points. For the Harry Potter Fan route as you suggested to get the timed HP ticket as late afternoon. Can it be possible us to play HP Forbidden journey in the morning if it is not my time slot to entry HP zone? How many time we can enter to HP zone? Thank you in advance yaaa. If it is not crowded in the morning yes you can! The suggestion is to protect yourself incase the park gets too crowded. You can enter the Harry Potter zone as many times as possible. But if the park is packed and the timed tickets are in place, you will only be able to use your timed tickets once! Hi, I would like to ask countdown party ticket. I found that this ticket can go inside since 8 PM. till 2 AM of January 1,2018 right? So.. the question is, they just open for just enter and look around or all the ride will open in the night time? For the VIP pass, they allow to enter before opening hour right? So if I have it, I can get in and go riding first or just the right for first Q inside? Unfortunately we do not have information regarding the countdown party ticket as we have not experienced it ourselves. For the VIP wristband, you will be in a queue that allows you to get into the park earlier. Do still arrive early because if you are at the end of the VIP queue, it will not make much of a difference as being in the normal queue. Hi, I was wondering after you get the harry potter timed ticket that is for an afternoon entrance will you still be able to go straight to the Forbidden journey or do you have to wait for your timed ticket to go for this ride? Hi danica! It really depends on the crowd that day! The strategy is to try and get the timed ticket, if it’s required. The times ticket is for entering that section of park and not for the ride. For the ride, you will need an Express Ticket! Hello! Thanks for this very informative article!! When you mention “timed ticket”, you don’t have to have an express pass to get this timed ticket right? Would you recommend express pass if I am travelling in early Feb to Osaka? Nope you don’t need an express pass for the timed ticket if you get it at the park. But if you buy an express pass, you’ll also be given a timed ticket! Early Feb is a good period, though I think avoiding weekends is still key! If you can’t avoid public holidays or weekends, it might be a safer bet to get the express pass. it’s really hard to say though! Hi, I need your help and advice. It’s our first time to Universal Studio Japan and we will go on February 8 (Thursday). Couple and 2 teens. I just checked KLOOK for the Universal Express PASS 4 and it is too expensive (SGD128 per person). We will probably just try to get a timed ticket and go early. 2. Is the timed ticket only for HP? How about other popular rides like Minion Mayhem, Spider-Man, Backdrop? 3. After getting the timed ticket for HP, do we just do the normal queue for other rides? 4. Is there something like Fastpass (Disneyland) for each ride for us to get a ticket and go back at designated time? 5. How long are the queues for other rides other than HP? 6. Have you tried the outdoor rides on winter season? Hope you can reply me, thanks! Hope we can answer your questions here. 2) The Timed-ticket mentioned in the article is specific for HP. However if you get the Express Pass, you will also get a timed ticket for the popular rides. 5) It can be as long as 4hrs or as short as 15mins. Really depends on when you go. 6) Not yet but the team is heading there in a few days! 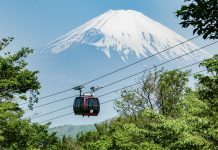 Cool Japan is back and refreshed for 2018. If we get the VIP Wristband for early-entry…. 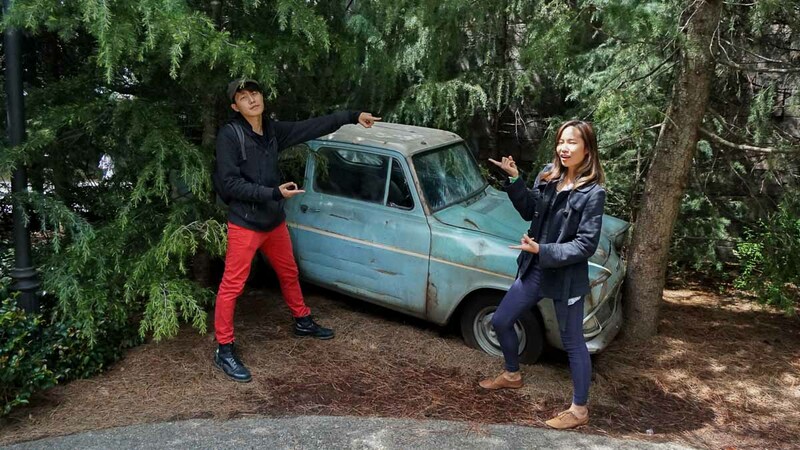 should we go immediately to take the HP ride? 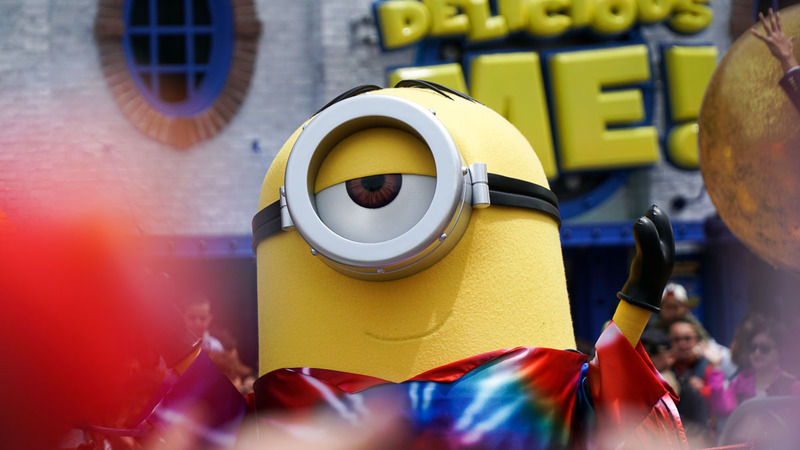 Or can we first get a timed ticket for HP (afternoon slot), and then go to Minion Mayhem first. Will the queue for the timed ticket also long? What is the best plan having a VIP Wristband. The timed ticket for HP will only be up when the park is too crowded. So if you head straight for Harry Potter world, there shouldn’t be a problem. The idea of the VIP wristband is to arrive early and try to complete 2 rides before the real crowd comes. Hello, is the Harry Potter and the forbidden journey claustrophobic? I have a major fear of enclosed space. That being said so, i managed to get through the transformers ride in Singapore Universal Studios, just barely however! 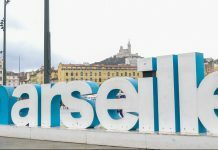 Hi, love this post and a lot of information (especially the pre-planning part) before heading there in mid-May. I got questions here to check with you guys. 1) If I purchased the Express pass, means I don’t need to get the timed ticket for The Wizarding World of Harry Potter and I just go as per schedule on my Express pass right? Unless I want to go for Expecto Patronum Night Show, then I will need to get timed ticket for late afternoon? 2) Because I am bringing my mom (she is 50 year old) together, any advice or suggestion like which ride is suitable for elderly? (2) Oh man. We were all a bunch of young people so didn’t really pay attention to that. I reckon the rides in the children zones should be appropriate unless your mom is super adventurous! Hi Bea! Glad you found it useful. That might be tricky because people usually stay in the park the entire day so arriving in midday might not make much of a difference. Would suggest getting the Express Pass via the link on the site! Is it possible to change times for the Express Pass? Will be attending with other who have been given different times. Hi Adam, based off our understanding I don’t think so! Perhaps you can try asking the company you bought it off from? I went to usj for my birthday in 2nd May 2018. Hi ! Do you know what the exact time for the Harry Potter Expecto Patronum Night Show ? Because I got the 3:30 timed entry (express pass), and planning to get another one for the late evening one, so I can enjoy the world at night and watch the show.. Thanks ! Hello, from memory there’s a few shows starting from 530 and lasting till 730. The schedule changes according to the season so it’s best to check on the day itself! Can ask the staff there or pick up the leaflets near the entrance. Hi Shina, sorry but we are unable to advise as we do not work directly with USJ. Have you checked the link on Klook? Thanks for all the tips. 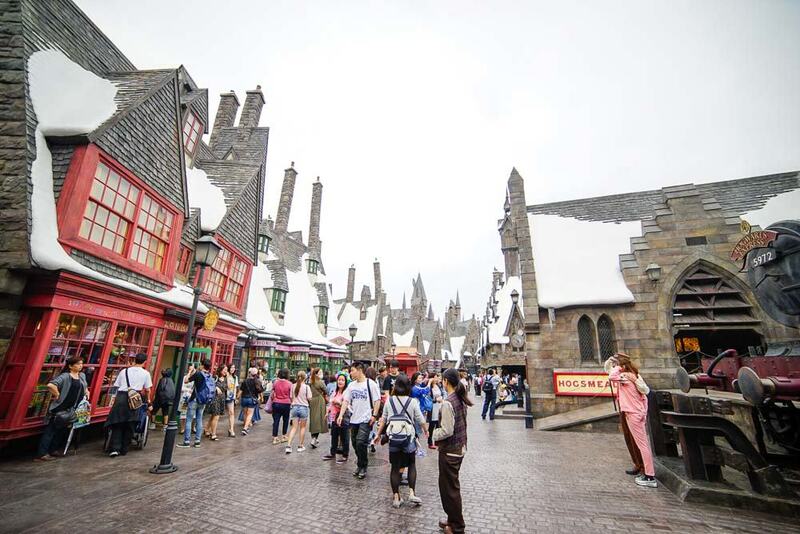 I’m a HP lover and will follow your suggested route in USJ. 1. As at Nov 2018, I don’t seem to be able to find the “Expecto Patronum Night Show” you mentioned here. Instead, there is the “Hogwarts Magical Nights”. Has the latter show replaced the former? 2. Where is the best place in your opinion, to stand to catch the “Universal Spectacle Night Parade – The Best of Hollywood” parade? We haven’t been there in a year so there’s a chance the show has changed! No prob. Thanks for the tips. Will be visiting in 2 weeks. Keep you posted about the junction outside T2. USJ is fantastic. I’ve done USO, USS as well. and USJ competes with USO and Islands of Adventure, which is saying something. All of the tips above are great, here are my suggestions: If you are paying the money to go here you HAVE to get the Express Pass. I’ve never got an Express Pass before, since I have just done Single Rider, but forget the Single Rider being an adequate alternative for the popular rides. If you are going to spend on the express pass and tickets, get the VIP wristband. It sounds confusing as to what the advantage is. But its simple, even though you and the regular entrants get in the same time officially, you have a head start as they pre-scan your tickets and you are siting in a gift store. Therefore when the gates open you just go in the park. Normal entrants still need to wit their turn to get their tickets scanned. Because the lines are long its a big advantage. I guess if you are first 5 in line at each turnstyle for the normal entry you have the same advantage, but to get that you need to be there maybe a few hours in advance. So get the VIP pass and come about 1/2 hour or so before the time they give you. I did and as literally near the door. It was fun to sprint out with the others…even though I had no need to sprint :D. Next, my advice is to use that opportunity to ride the best rides that is NOT on your express pass. I had the Flying Dinosaur 7 pass and used the time to ride Hollywood Dream Backdrop. I was tempted to go to Harry Potter but figured not to since It was already on my pass. Now if you are a Harry Potter FANATIC and need to ride Forbidden Journey twice, I guess. but I’ve rode it twice at Orlando and Backdrop is a tremendous ride and a fantastic way to start the day! Also dont waste the express pass on the rides which have shorter lines or that can take a lot of people like Jaws, Backdraft , and Terminator (unless you want to be in the front) if you have the option of a more popular ride like Spiderman, regular Hollywood Dream, etc. Thanks for the really good tips and insight! Really agree with some of your strategies. There are no individual express passes however, you could head to the park early (be one of the first few in line!) and go straight for Harry Potter’s world to get your timed ticket. 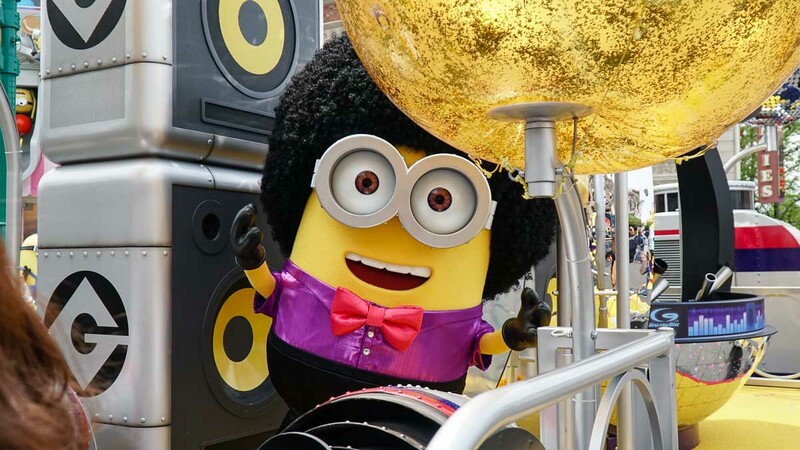 I am planning on buying the express pass 4 – minion ride from the USJ Japanese website for our visit. It seems you can select the timed entry options for the HPW entry, the Forbidden Journey ride and the minion ride Iwhereae you cannot on Klook/Voyagin) . It think you said you bought tickets this way before. Which timed combo did you pick? There are several combinations. My dilemma is whether to choose the options to go to HPW first thing or later in the afternoon. My daughter loves HP, so we will want to spend a lot of time there. But since the Minion Ride is outside of the HPW, if I choose to go HPW in the morning and my timed minion ride in the afternoon, that means I must exit the HPW with a risk of not being able to go back in. What would be your recommendation? I know my daughter is going to want to go straight to HPW upon getting into USJ, but would you say the better strategy is to explore the rest of USJ in the AM and then go into HPW in the PM? Are the crows heavier in the AM or PM? And is it true that there are only 2 restaurants in HPW, so better to have lunch before going in? Yup you are right in saying that the timed entry ticket can only be used once. It really depends on the crowd that day but I think your strategy is safe if you want to spend a lot of time in HPW. 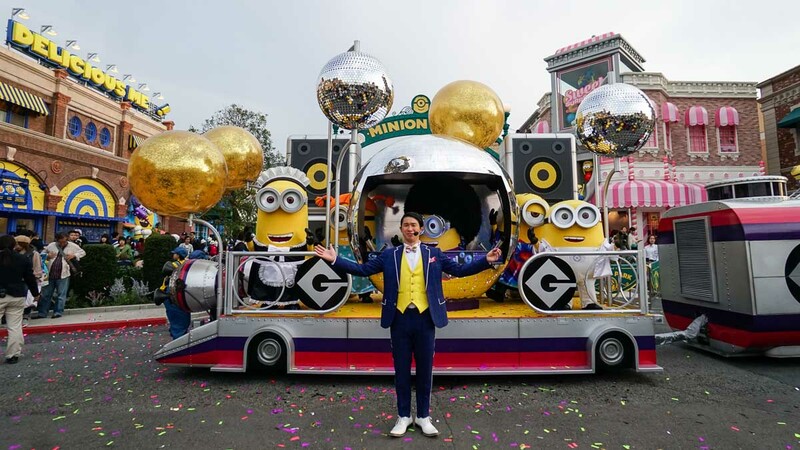 So I would suggest that you do Minion and the rest of USJ first before heading into HPW. Hi, where is the Studio West located? Near what? Thanks! Great article! I’d like to ask what are the average costs of the souvenir photos? Are there staff stationed around the theme park to help with photos? Hi Angie, we aren’t sure, but it should be ~1,800 yen per photo. Thanks for this article! It’s so helpful! I’m planning to go USJ mid May, and seems like it’s best to pick either a Wed/Thurs to go where it’s less crowded. I’m a huge HP fan but I’m so confused with the timed entry tickets. Am I right that the timed entry is for entering to the entire Wizarding World, and not just limited to the rides? So potentially if I have a timed entry for mid morning, and I leave, then I might be denied entry to watch other shows at Wizarding World? There’s a new Hogwarts Magical Celebration at the Castle now but it’s only at these timings: 19:40 / 20:05 / 20:30 / 20:50, so I wonder if I need to get a second timed entry ticket to go back in the evening to watch these shows. Also, do you know how would we know if a timed entry ticket is needed? I went to the USJ website and it mentioned “during peak periods”. Any advise is greatly appreciated 🙂 Thanks! Timed entry tickets are only for entrance to The Wizarding World of Harry Potter. The purpose of these is to control crowds going into that section of the theme park. So yes if you enter in the morning and leave to come back later, you may not be able to enter again if there are too many people (unlikely though on a Wednesday as long as it’s not a public holiday). Timed tickets will only be issued on the spot if the park is too crowded! So most of the time you don’t really need it. For rides, you actually have to look at express timed tickets from the Express Pass.